2009-07-02. Good. Ships with Tracking Number! INTERNATIONAL WORLDWIDE Shipping available. May not contain Access Codes or Supplements. May be ex-library. Shipping & Handling by region. Buy with confidence, excellent customer service! Threshold Editions. Hardcover. B002EPDMWM New Condition. . New. Threshold Editions. Hardcover. 1416562850 Please allow 4 - 14 business days for Standard shipping, within the US. Thank you for supporting our small, family-owned business! . New. 2009-03-24. 1st. Threshold Editions. Hardcover. 1416562850 Please allow 4 - 14 business days for Standard shipping, within the US. Thank you for supporting our small, family-owned business! . Fine. 2009-03-24. 1st. Threshold Editions. Hardcover. 1416562850 New Condition *** Right Off the Shelf | Ships within 2 Business Days ~~~ Customer Service Is Our Top Priority! - Thank you for LOOKING :-) . New. Threshold Editions. Paperback. 1416562877 Please allow 4 - 14 business days for Standard shipping, within the US. Thank you for supporting our small, family-owned business! . New. 2010-06-01. Reprint. Threshold Editions, 2010. Paperback. New. 8.25 x 5.31 cm. Threshold Editions. Hardcover. B002EPDMWM Like New Condition. . Fine. Threshold Editions. Hardcover. 1416562850 Please allow 4 - 14 business days for Standard shipping, within the US. Thank you for supporting our small, family-owned business! . Fair. 2009-03-24. 1st. New York, NY: Threshold Editions, 2009. Reprint. Later printing. Hardcover. Very good/very good. Glued binding. Paper over boards. x, 245,  pages. Notes. 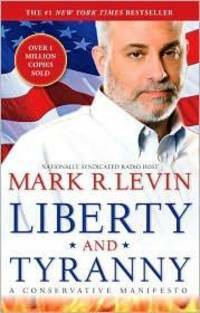 Mark Reed Levin (born September 21, 1957) is an American lawyer, author, and the host of American syndicated radio show The Mark Levin Show. Levin worked in the administration of President Ronald Reagan and was a chief of staff for Attorney General Edwin Meese. He is president of the Landmark Legal Foundation, has authored five books, and contributes commentary to various media outlets such as National Review Online. Liberty and Tyranny: A Conservative Manifesto was released on March 24, 2009, and became a #1 New York Times best seller for eleven of twelve weeks, as well as No. 1 on Nielsen's BookScan. It came in at No. 2 on Amazon's list of bestselling books of 2009. The book includes discussion of a variety of issues that, according to Levin, need to be addressed in the United States. In Liberty and Tyranny Levin repudiates the use of the term "progressive" to describe "modern Liberals" and instead argues a proper term should be "Statist." Conservative talk radio's fastest-growing superstar is also a "New York Times" bestselling phenomenon: the author of the groundbreaking critique of the Supreme Court, "Men in Black," and the deeply personal dog lover's memoir "Rescuing Sprite," Mark R. Levin now delivers the book that characterizes both his devotion to his more than 5 million listeners and his love of our country and the legacy of our Founding Fathers: "Liberty and Tyranny" is Mark R. Levin's clarion call to conservative America, a new manifesto for the conservative movement for the 21st century. In the face of the modern liberal assault on Constitution-based values, an attack that has steadily snowballed since President Roosevelt's New Deal of the 1930s and resulted in a federal government that is a massive, unaccountable conglomerate, the time for re-enforcing the intellectual and practical case for conservatism is "now." Conservative beliefs in individual freedoms do in the end stand for liberty for all Americans, while liberal dictates lead to the breakdown of civilized society -- in short, tyranny. Looking back to look to the future, Levin writes "conservatism is the antidote to tyranny precisely because its principles "are" our founding principles." And in a series of powerful essays, Levin lays out how conservatives can counter the liberal corrosion that has filtered into every timely issue affecting our daily lives, from the economy to health care, global warming, immigration, and more -- and illustrates how change, as seen through the conservative lens, is always prudent, and always an enhancement to individual freedom. As provocative, well-reasoned, robust, and informed as his on-air commentary, Levin's narrative will galvanize readers to begin a new era in conservative thinking and action. "Liberty and Tyranny" provides a philosophical, historical, and practical framework for revitalizing the conservative vision. Riverside, New Jersey, U.S.A.: Threshold Editions, 2008. Book. New. Hardcover. new hardback with new jacket featuring photo of author. Threshold Editions, 2009-03-24. Hardcover. Very Good. Nice looking book, has minor edge wear. Threshold Editions. PAPERBACK. 1416562877 . New. Threshold Editions, 2009-03-24. Hardcover. Used:Good. Threshold Editions, 2010-06-01. 1 Reprint. Paperback. Used:Good. Threshold Editions. PAPERBACK. 1416562877 Special order direct from the distributor . New. Threshold Editions. Hardcover. 1416562850 *LIKE NEW* Ships Same Day or Next! . Fine. Threshold Editions. Hardcover. 1416562850 *BRAND NEW* Ships Same Day or Next! . New. New York City: Threshold Editions, 2009. 1st Edition. Hardcover. Fine/Fine. 8vo - over 7¾ - 9¾" tall. Beautiful First Edition, First Printing, tight, solid and clean throughout. Equally attractive unclipped wrapper is fresh and bright with no creases, chipping or tears. A sharp collectable copy offered at a great price. New York: Threshold Editions, 2009. Nice and tight, one page has a paperclip impression showing.. First Edition / First Printing. Hardcover. Near Fine/Near Fine. Threshold Editions. Hardcover. 1416562850 Brand new. Any book may show light shelf wear from warehouse storage and handling. . New. Riverside, New Jersey, U.S.A.: Threshold Editions, 2009. Hardcover, very good condition.. Hardcover. Very Good/Very Good. Threshold Editions. Hardcover. 1416562850 Ships promptly from Texas. . New. 2009. Threshold Editions, March 2009. Hardcover . Very Good/Very Good. Very Good Hardcover with Very Good Dustjacket. Light soiling and shelfwear to DJ. Light soiling and shelfwear to covers. Textblock yellowing. Pages clean and tight in binding. Pictures available upon request. A locally owned, independent book shop since 1984. Threshold Editions. Used - Good. Ships from Reno, NV. Former Library book. Shows some signs of wear, and may have some markings on the inside. 100% Money Back Guarantee. Shipped to over one million happy customers. Your purchase benefits world literacy! Threshold Editions. Used - Like New. Ships from Reno, NV. Book in almost Brand New condition. 100% Money Back Guarantee. Shipped to over one million happy customers. Your purchase benefits world literacy! Threshold Editions, June 2010. Trade . 3 PB standard 50%. Threshold Editions, 2009-03-24. Hardcover. Very Good. Pages are clean with no markings. Threshold Editions. PAPERBACK. 1416562877 BRAND NEW, GIFT QUALITY! NOT OVERSTOCKS OR MARKED UP REMAINDERS! DIRECT FROM THE PUBLISHER!|0.5 . New.